Internet Search Activities Reproducible Workbook - school-wide License for 20 web searches! The importance of using the right keywords and search strategies is critical to using the Internets vast array of web sites. 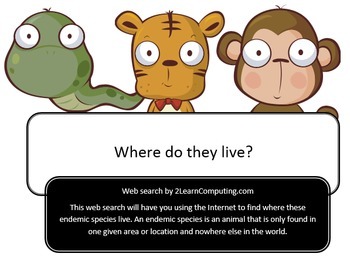 This workbook includes 20 ready-to-use educational Internet search activities with 20 questions each. These searches can be used as assessments, supplemental work, and/or homework assignments for extra research practice. Your students will learn how to navigate through Internet search engines to obtain information efficiently and accurately. Your students will not only find the information in the searches but will also verify the URL they used to find the information. The searches were made being careful NOT to use Wikipedia topics that contain all the answers. The student will have to view various resources before the questions can be answered, none of the searches have questions whose answers can be easily found on just one web site. ALL searches include ANSWER KEYS for the teacher (URLs will vary for each student). • Teaches students how to navigate through Internet search engines to search and obtain information efficiently and accurately. • Students are required to verify each source URL when answering the questions. • Teen topics as well as more educational topics. • Each web search includes 20 questions. • Unlimited reprint rights for your classroom. 8. Gather relevant information from multiple authoritative print and digital sources, using advanced searches effectively; assess the usefulness of each source in answering the research question; integrate information into the text selectively to maintain the flow of ideas, avoiding plagiarism and following a standard format for citation. 8. Gather relevant information from multiple authoritative print and digital sources, using advanced searches effectively; assess the strengths and limitations of each source in terms of the specific task, purpose, and audience; integrate information into the text selectively to maintain the flow of ideas, avoiding plagiarism and over reliance on any one source and following a standard format for citation.